It's good for the drought and it's good for the rain beetles. 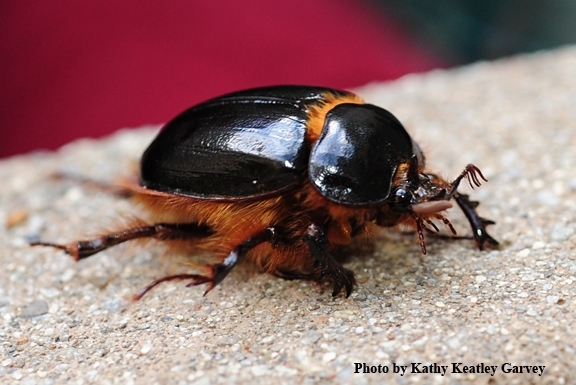 If you've never seen a rain beetle (genus Pleocoma) no worries. Most people haven't, either. You have to be in the right place at the right time, which amounts to being in a fall or winter rainstorm in their habitat before sunrise or just after sunset. And you have to work quickly. The males can fly only a couple of hours before they die. The females are flightless. 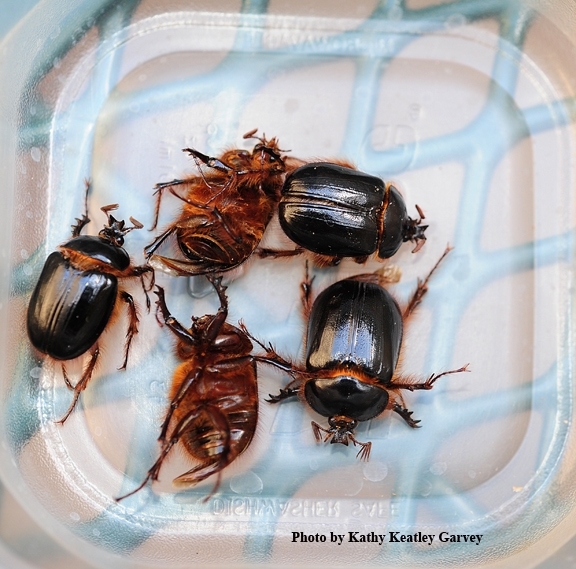 We saw our first--and last--rain beetles back in October of 2012 when a graduate student in the UC Davis Department of Entomology and Nematology showed us several that a friend had been collected in the Shenandoah Valley of Plymouth, Amador County. What intriguing insects! They spend most of their lives in immature stages beneath the ground, and that can total a decade or more, scientists estimate. The adults surface when the ground is soaked. 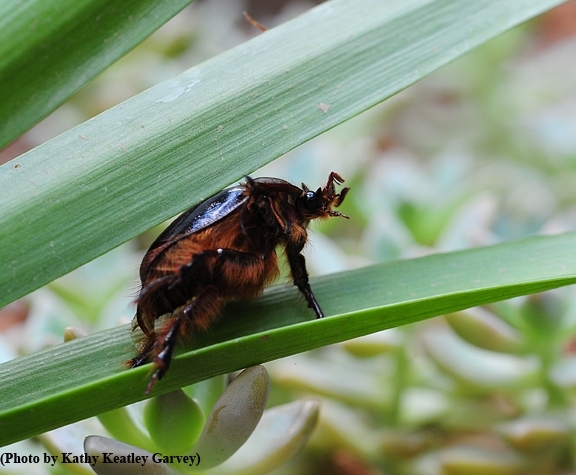 You'll never seen adult beetles eat because they don't. They have no mouthparts or digestive tracts. They rely on the fat stored from their larval stage. As underground larvae, these insects feed on shrub and tree roots, fungi and other organic matter. Larvae can be pests when they attack the roots of apple, pear and other orchard trees. And hairy. Indeed, Pleocoma is Greek for abundant hair. Fascinating! I'd never heard of these insects. Now I hope to find one for my collection. Today, 10/18/16, I saw one of these in the Fork Lift parking lot in Cameron Park, CA. I had never seen one before, and considering how rare they are, according to this article, I now feel I am extremely lucky! I picked him up and put him back in one of the planter boxes where he (or she) dug himself a new hole and stayed. What a great day! I have these all over my yard right now! Just had two of these come out of nowhere to attack my breezeway light. They looked like they were flying drunk; kept flying into the walls. I had to dodge them! Always wondered what these are. We have hundreds of them come out of the ground for days after the first good rain. Our dogs love to chase them around and eat them. They must taste good. Just discovered these little guys today in some hills next to Rattlesnake Mountain in Reno,Nevada. Found your article and am amazed by what I have read about them. I feel quite lucky to have seen these little guys. What a strange life that they have. Wow, 10 years underground. Thank you for this lesson you have shared. I was amazed learning about the humming bird moth but the rain beetle is much more amazing and unusual. Great day! Found one next to my bed this morning. May have come in with the dog. Scared me to death. I am NOT a bug person. Am staying at a property out in country. This thing gave me the heebie jeebies! Is it likely I'll encounter more. Am a pet sitter, owner says never seen any before. This is by Hillsboro Oregon. Why are these things so revered? This bug i met was polite. Didn't fly at me or anything. Thank God. I have these down in my woods near Amity,Oregon.I always wondered what they were. Just Collected four in Placerville, Ca. First big rain in Penn Valley, Nevada County this afternoon. Heard light thuds hitting window and turned on porch light to find about 50 of these friends flying and crawling about on the front porch. They are all over the outside of our house right now. 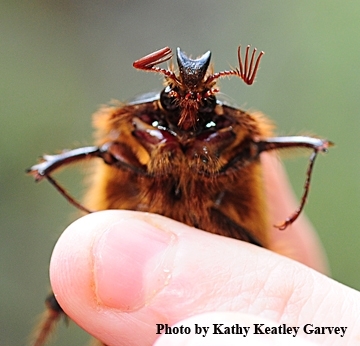 Thinking it might be one of the plagues (we have been having a rough year with fire, drought, politics) I quickly googled rain and beetles and found your page. Now I feel thankful to have witnessed this rare event. We’re in a rural area, not too much development. Glad these guys have a place to live. Growing up in Los Angeles, as soon as my brother Bruce had a car he would drive up into the Santa Monica Mountains hoping to get a look at the emerging rain beetles during the first fall rains. They always escaped him. Fast forward 40 years and now I’m living in the Sierra Nevada and look forward to their emergence every year. My brother’s love of nature and appreciation for obscure life forms (to most) has greatly enhanced my views. I sent him his rain beetle. We have these in Somerset, Ca, near Plymouth. Very localized, nearby in Placerville no one knows about these. They’ve been an annual occurrence for as long as I can remember. I actually think they’re kind of cute. They have a very goofy way of flying and when they crawl it’s very bumbly. They are very strong and if you hold one in your hand it will push its way out between your fingers. This year a few came out before the first rain. It was weird and I chalk it up to climate change. I just found 15 or 16 outside my front door in Groveland, Calif.
We first discovered these guys back in 1986 when we moved from the Willamette Valley of Oregon into the foothills west of Junction City. We had moved into a single wide trailer with metal siding and these guys woke us with their relentless bouncing off the sides of the trailer. Being a native of Oregon I had never seen these beetles before. Every year since we see them early in the mornings after the first rains of the fall. We get them each year here in Mariposa in the evening after the first rain. They came out tonight! We never got them in Coarsegold. Found your page because our kitchen window was being pelted tonight and HAD to figure out what these giants were! 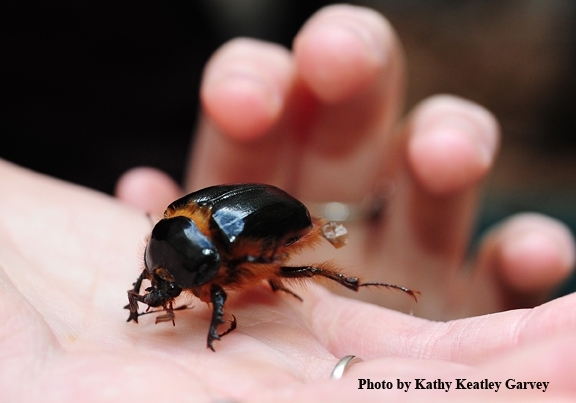 I had no idea these large beetles were so intriguing! My husband said the last time he saw them was in 1983-ish in Placerville. Today, we’re in Coarsegold, CA. Fresno foothills near Tollhouse, elevation about 1850. I'm in a trailer while my house is under construction and heard them hitting the trailer at about 10 per minute starting at about 3 a.m. Based on inputs from Coarsegold and Mariposa, this must be a good year for them for this area.